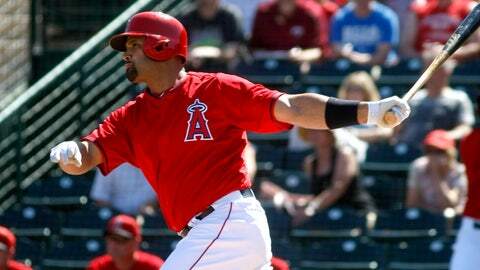 Albert Pujols doubled twice in the Angels' win over the White Sox. GLENDALE, Ariz. (AP) — Albert Pujols doubled twice, Mike Trout hit a solo homer and the Los Angeles Angles beat the Chicago White Sox 14-10 Wednesday. Jordan Danks hit his fifth homer of spring training for the White Sox. Matt Davidson hit a three-run shot and Adam Eaton doubled twice to raise his average to .343. Tyler Skaggs, the Angels’ likely No. 5 starter, gave up five runs and seven hits in 4 1-3 innings. "The command is definitely not where I want it to be," said Skaggs, who has two more spring starts. "I’ll work in the bullpen on keeping the ball down. … and throwing strikes." "He struggled," Angels manager Mike Scioscia said. "His stuff looked good, but repeating pitches was tough for Tyler." White Sox pitcher Erik Johnson, a contender for a rotation spot, gave up eight runs — seven earned — in four innings. Howie Kendrick went 3 for 3 for the Angels to raise his average to .441 and Kole Calhoun had two hits and made a great catch at the right field fence to stop a White Sox rally in the fifth. Ian Stewart hit a two-run homer for the Angels. White Sox: Johnson, a contender for a rotation spot, gave up seven runs — six earned — in four innings. "It’s a simple formula. You put yourself in holes and give away free bases, you put yourself in bad spots," Johnson said. "And you’re going to have to pay for it. "I feel prepared. I know what I got to do to have success. It’s not putting yourself in a hole and work behind in counts," he said. Eaton appears set to bat leadoff and play center field. "I hope I earned it." Eaton said. "I feel (manager Robin) Ventura and these these guys have put some faith in me at the top of the order. I hope to contribute and help this team win ballgames." Eaton was sidelined much of the season because of an elbow injury. "When you can get consistent at-bats and compete … good things happen. You forget you’re at the plate sometimes," Eaton said. "My arm feels great. I’ve made some pretty good, consistent throws. Everything seems like it’s going in the right direction." Before the game, the White Sox optioned catcher Josh Phegley, right-hander Andre Rienzo and left-hander Eric Surkamp to Triple-A Charlotte. They also assigned right-handers Chris Beck and Cody Winarski and infielder Andy Wilkins to minor league camp. White Sox: Reliever Matt Lindstrom, who has not pitched in a Cactus League game because of a strained oblique, threw a bullpen session Wednesday. … The Sox hope second baseman Gordon Beckham, shut down on Saturday because of a strained oblique, can get enough work in by the end of the month to be ready for the season’s start.